Ooooh, LIana, you just slay me! 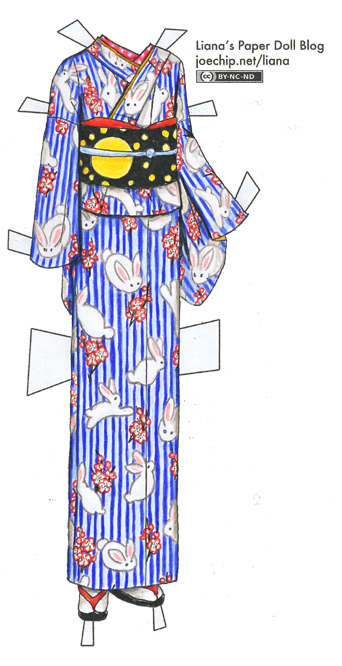 XD Tsukino usagi kimono! I want one just like that to wear around my house… and everywhere else, really. I love it! You’re making me want to eat mochi. Om nom nom. The frozen ones. Yum. It is SOOOOOO good… Will you be making one for all the chinese animals? Those bunnies are amazingly cute. Wonderful kimono and the complicated pattern is beautifully rendered. Those bunnies are cute enough to eat! nomnomnom! You seem 2 b in a kimono mood! YAY!!!!!! wishing that u would get back to regular clothes. :-( who wears things with rabbits on them anyway?? wishing that u would get back to regular clothes. :-( who wears things with rabbits on them anyway??? I just had to leave a comment for your fabulous blog! I stumbled across it–I can’t remember how just now–two days ago, and I’ve spent the last two days reading every single post. Not just looking at the dresses, mind you, but actually reading every word of every post…except for maybe two or three that were a little too heavily video game for my tastes. :) Anyway, I just wanted to say that I’m completely inspired! The outfits are stunning–beautiful, brilliantly drawn, and incredibly creative. And your writing! I’m a writer but I’ve been on hiatus for rather a long time with writers block, but I think your fantastic imagination has got me right back on track! Thank you for sharing your talents with all of us. Since when does Liana do “regular” clothes? Her work is too fantastic for that! ^_^ Now I wanna do a just-for-kimono doll. It’s OK, it’s not that easy to hurt my feelings! :) It’s perfectly fine to have opinions on what I should do, I don’t mind. But to be honest, I pretty much always just draw what I want to draw. I’ve said it before, but if my sole aim was to attract readers and fans, I’d do nothing but Taylor Swift and Twilight ;) So feel free to give me your opinion, but I probably will be doing a lot of kimonos in the near future, simply because that’s what I want to learn about and practice. If I wasn’t a curvy kind of girl, I would be running to a fabric designer and dress maker to have this exact kimono made for my own enjoyment. What a great idea: contemporary/modern fabrics for the traditional kimono. You rock! Wouldn’t it be cool if we all felt comfortable wearing different clothing styles, as they do in India, wearing a traditional sari one day, then jeans and a tee shirt the next day. By the way…did I miss a sari collection? Fashion week in India sari collections floored me! Wanna wear a sari too! Hey, I just found this. I’m really interested in Asian cultures and languages, and I found this really interesting and informitive. I was wondering whether or not you were going to draw a Japanese paper doll to go with your kimono. Just wondering! Thanks!